Earlier on the weekend, needing a mixer, J picked up a bottle of Coke Zero and stashed the remnants in my fridge. I didn’t partake in any at the time, but last night as I flipped on a movie and popped some popcorn, I reached for a glass. After what seemed like five minutes later I checked my cell phone clock again. It was now 12:55 a.m. I flipped, tossed, turned, stretched, covered up, uncovered and checked my clock again. 1:52 a.m. By the time 2:23 a.m. rolled around, I stopped checking and finally fell asleep not long after. What frightened me most as I struggled with this extremely rare occurrence of insomnia was the severe impact that one little glass of “zero” cola could do to my entire body. “What was even in that stuff anyway?” I thought to myself. If that one little glass was strong enough to impact me in such a way from the top of my head to the tips of my toes, it couldn’t be good for me. And that got me thinking to which other foods and drinks I consume that could also have potentially negative effects. In recent weeks I’ve undertaken to increase my organic food consumption because those foods are better for me. However, I’d yet to consider the flip side of the coin and wondered why what I was cutting out was bad for me. About two months ago I gave up my daily cups of coffee, swapping them for green tea. I’ve also tried to reduce my refined sugar intake and increase my daily fibre through fresh vegetables. Last night’s wake-up call certainly served to reinforce my new choices. What’s one thing you have a habit of consuming that you’d be better off without? I’d imagine the caffeine contain in a bottle of coke is pretty high. Probably why you were tossing and turning? I try not to eat fake sugars either. I have been trying to reduce the amount of white flour I consume, in order to manage my stomach issues. I was going to mention the caffeine too. If I have any version of Coke even early in the evening I’m up all night and it’s infuriating! Sometimes even dark chocolate will do it too. 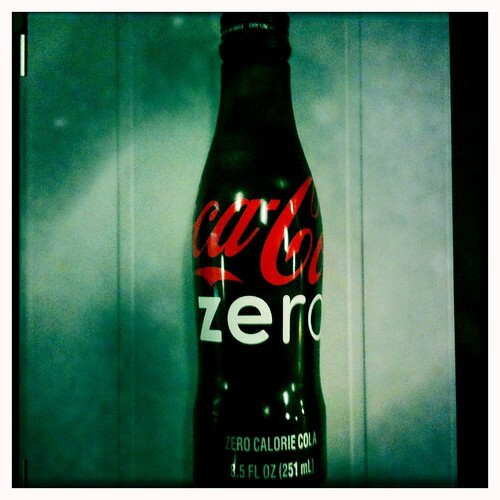 I think Coke Zero has something like 35 mg of caffeine which is probably enough to keep you up. A regular coffee still has more but I guess it depends on how your body metabolizes the caffeine. Won’t do that again, eh? Hope last night was a better sleep. Definitely sugar and white bread. Bad Bad evil stuff. well, since I am definitely sensitive to gluten, anything with gluten in it (and that covers a LOT of ground)– but I love love love bread and although Udi’s is pretty close to delish, it really doesn’t cut it. And it costs a lot for a teeny tiny little loaf. However, it IS the best GF loaf I have come across and it beats gut ache and the other metabolic payback… great question! (oh, and gluten sensitivity is often linked with caseine (dairy) sensitivity, so yeah, staying away from cheese is also an issue).